Enchiladas are delicious and delicate. 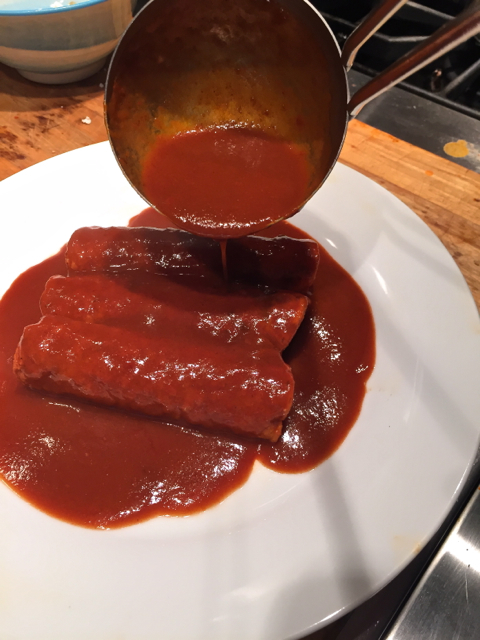 This red enchilada is perfect for romance and to say I love you. I’ve blogged before that to understand an enchilada is to understand our history and community. The tortilla is not a wrap for filling. It is the thing itself: a well made corn tortilla, cooked on a comal, immersed in carefully blended chiles, accentuated by the slightest of queso fresco and onion bits. In my family, my amá always made red enchiladas with red tortillas. Always. My nephew, Adrian, once chastised me for using a regular tortilla instead of a red one. “That’s not our family tradition,” he decried. He was right. So, here’s an adaptation of our mom’s family enchilada recipe. There is no English word that accurately translates “enchilada,” the past participle of the verb, “enchilar.” Merriam-Webster translates enchilar: “to season with chili,” but that does not describe this dish. “Enchilar” means that the tortilla has been done up with chile, thoroughly infused and transformed. 1. Devein and de-seed 6 Guajillo chiles. Place them in boiling water, turn off the heat and let them re-hydrate for 20 minutes. 2. Drain the chiles, discard the water, and place them in a blender with 2 cups of water. Blend until you have a completely smooth, velvety purée. 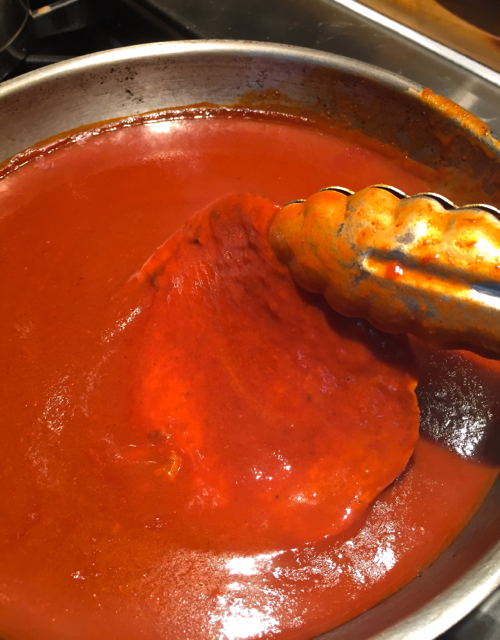 Drain through a fine mesh sieve to make sure there are no bits of chile left unblended. 3. Add two more cups of water and set aside. 4. 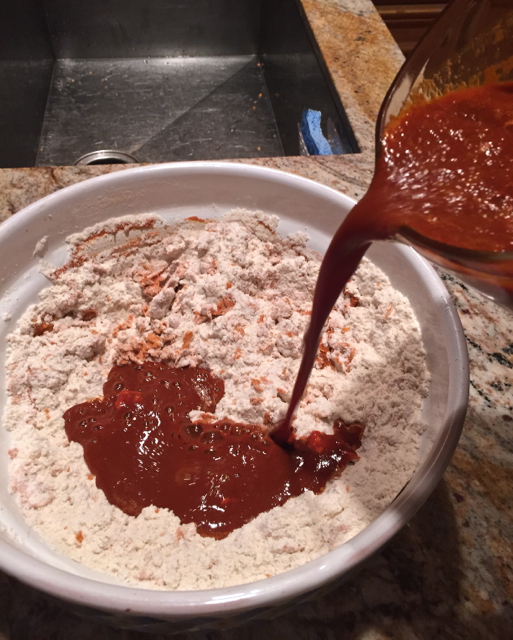 In a large bowl, place 4 cups of white corn masa and add the four cups of chile, slowly incorporating it into the masa to form a moist, firm masa that looks like the picture below. 5. Cover the masa with a damp cloth and let stand for 20 minutes to rehydrate the corn. (My neighbor across the street found non-GMO corn online and gave me a 5-pound bag. I used non-GMO corn and urge you to get a neighbor like mine). 6. Using a tortilla press like the one described in this previous blog, make round masa balls, flatten them with the tortilla press, and lay them gently onto a medium hot comal. 7. Cook for about 20 seconds. The tortilla will release and you can easily pick it up without a spatula (but be careful and use a spatula if you need it to lift up the edge). Cook that side for another 20 seconds and turn it over. Do this one more time. You’ll see that the tortilla puffs up with steam. It forms an outer leaf that is crisp and toasty while the inner masa cooks just enough so that it remains moist and meaty. 8. Make a batch of enchilada chile purée according to the recipe for enchiladas here, and dip a cooked, red tortilla in the chile, leaving it for about 8 seconds. 9. Lay the “done up with chile” tortilla on a plate and add 1 Tablespoon of crumbled queso fresco and a smattering of finely diced white onion. Finely diced is important. 10. Roll three of these tortillas next to each other, each immersed in the special blend of chiles. You’ll taste the flavorful corn saturated with chile, and the combination is spectacular. Pour plenty of chile on top and then sprinkle some more queso and onion. 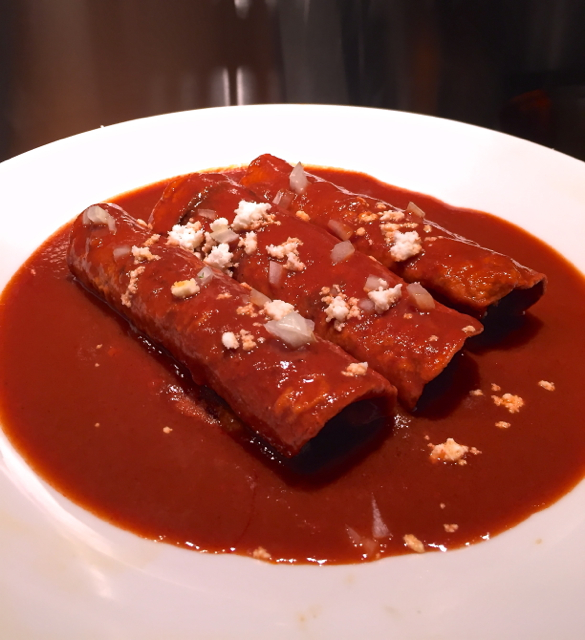 Enjoy— that’s a red enchilada! 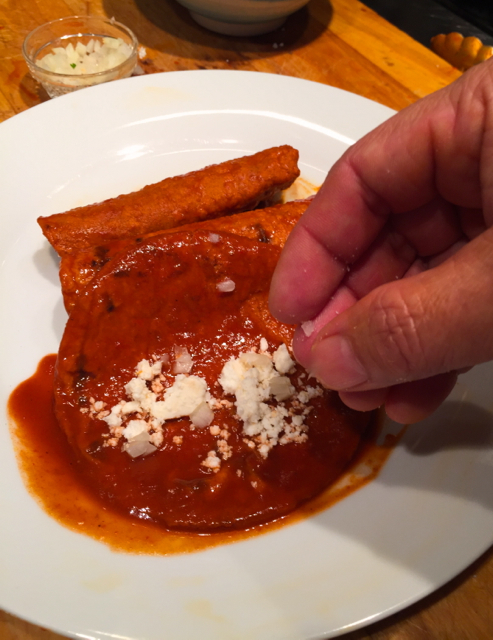 NOTE: More Enchilada recipes in my book, Truly Texas Mexican available online. Bravo Adán I’m making them tomorrow. I’ve been looking for a corn tortilla recipe. This might just fit the bill. Something similar, but different to store bought shells.